General information: Traditional pub. Timothy Taylor's on tap. Beer mats on the ceiling, antique water tap on the bar. Set in the heart of Didsbury, this smelly ancient boozer is one of the original pubs that used to welcome travellers using the old Didsbury station. The decor (I imagine) hasn't changed much, but it could do with a scrub. The beer is hit and miss, sometimes excellent, sometimes poor, the price is always high. Packed at the weekends and dead in the week, the nights tick over but the majority of their trade must come on a weekend, especially considering the huge TV (sports) which is perminantly on. Worth a visit, but not to often. Nobody told me about the free monkey nuts! After being taken to the curry delights of Rusholme, we went up the road to this pub. There is a quiz night. The quiz master went around with the papers. Completely by passed our table of two! Would have loved to join in - I knew that Jane Austen wrote Persuasion. Had a nice pint of Tribute - all the way from Cornwell to Manchester. Looked like one of the better pubs in this area. Next time I go, I will look for the nuts. And if I dont get invited to the quiz, I will shout out the answers. 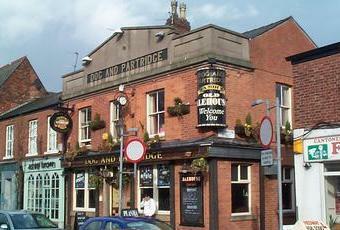 Agree with some of the other drinkers here - Didsbury is hit and miss with its pubs. D&P is a definite 'hit' though, my favourite since moving here three months ago. Good beer, good crowd (chain pubs usefully draw away the c**ts, of whom there are many in Didsvegas on a Saturday night), a 'proper pub' feel without making too big a deal about it. Oh, and free monkey nuts. Lovely. Packed. Need i say more? Although i did go in on Friday night. Seriously though, it was alright, i wouldn't recommend it but i also wouldn't tell people not to go.